BRANDON, Man. 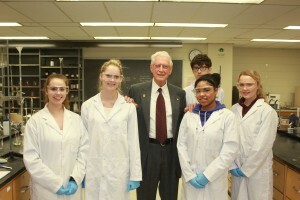 – Brandon University (BU) has dedicated chemistry labs in honour of two former faculty members. The Dr. Bruce & Mrs. Jane Forrest Laboratory for Physical Chemistry and the Dr. Peter Letkeman Laboratory for Analytical & Inorganic Chemistry have been dedicated in recognition of their distinguished careers and their generosity to the institution. Dr. Peter Letkeman with BU Science students. Letkeman’s career at BU spanned 1963 to 2003 during which time he taught Analytical and Inorganic Chemistry. From 1972 to 1980 he served as the Chair of the Department of Chemistry, and in 1982 he was appointed Dean of Science, a position he held until 1993. He was awarded 16 research grants, was made a Fellow of the Chemical Institute of Canada, served on the Manitoba Research Council, and chaired the pension committee in its early years. During his tenure at BU, he published 17 peer-reviewed papers, the last three of which were published following the loss of his sight. 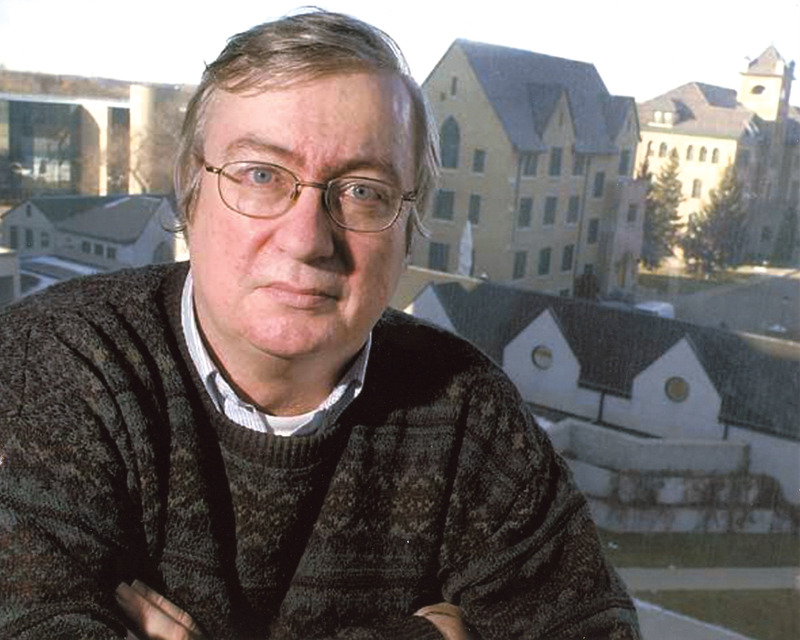 In 2003, in recognition of 40 years of distinguished service, Letkeman was presented with the President’s Medal for excellence in teaching, research, and service. A strong advocate for post-secondary education, Letkeman has been instrumental in the establishment of two scholarships, the Dr. H.V. Kidd & Dr. Peter Letkeman Scholarship in General Chemistry, and the Dr. Peter Letkeman Scholarship. Forrest’s career at BU began in 1986. 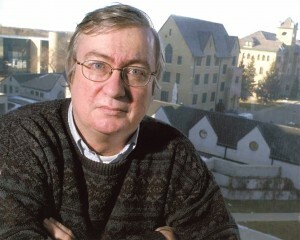 He served as Chair of the Chemistry Department for 16 years between 1988 and 2010, taught 11 different courses, obtained 11 equipment and research grants totaling more than $450,000, served as President or Vice-President of the BU Faculty Association for 10 years, and served as a member or Chairperson of the BU Pension Trustees for 10 years. During his time at BU, Forrest was responsible for the instruction of all Physical Chemistry Labs that took place in the Laboratory for Physical Chemistry. Before his passing in 2013, Forrest established The Dr. Bruce and Mrs. Jane Forrest Scholarship for Physical Chemistry. He also established a bequest to fund The Dr. Bruce and Mrs. Jane Forrest Scholarships for Honours/Majors Chemistry, which provides numerous awards for second-, third- and fourth-year chemistry students.